Tablets, especially the Apple iPad Pro or Apple iPad Air, can be a musician’s best friend. Many tasks previously using paper or even worse, a laptop, can now be accomplished on an Apple iPad. The most common reason for attaching any tablet to a microphone stand is for sheet music. Sure, you could print it off, but that’s nearly as cool as using a tablet. Hence, the reason for our article on how to attach an Apple iPad to a microphone stand. The most common type of mount used for attachment to a microphone stand are those that have a clamp or vise at the base. Not all clamp mounts are going to work well. Most microphone stands are no more than one inch diameter, so you will want to ensure that the clamp will open wide enough. Secondly, be sure the cradle part of the mount will open wide enough to fit the tablet. Decide if your mount will need to be flush with the microphone stand or will need an extension arm. Mounts that have a flush fitting will not tilt upwards sufficiently for the musician to see effectively. It all depends upon the individual. If you’re standing at the microphone stand, get an extension. If seated, a flush mount will work better than one that has an extension arm. The photo that accompanies this article is the Arkon Heavy Gooseneck Clamp Mount for Apple iPad Pro, iPad Air and Other Tablets attached to a microphone stand. It’s my absolute favorite for attaching an Apple iPad to a microphone stand. This mount has several advantages. This mount includes an all important 12″ flexible gooseneck extension attached to a metal clamp that opens to 2.25 inches. The included cradle is expandable and will hold the largest Apple iPad Pro, the midsize Apple iPad Air and even the smaller Apple iPad Mini. You can customize the cradle by using a combination of the leg sizes that are included with the mount. The tablet can be swiveled into portrait or landscape. Another method for attaching a tablet to a microphone stand is to mount the tablet to the top of the stand. Removing the microphone holder part of the a standard microphone stand will reveal a screw that has either a 1/4″ – 20 threaded or 5/8″- 27 threaded screw pattern. Mounts for tablets are available that contain this screw pattern. Be careful to select a mount that is made specifically for microphone stands as these are a specialized fitting. The IK Multimedia iKlip Xpand Universal Mic Stand Support for Apple iPad and Tablets is for those that are looking for a flush mount to a microphone stand. The mount includes an expandable cradle that fits tablets with screen sizes from 7″ to 12.1″. The clamp expands to 1.2″ which is wide enough for the majority of microphone stands. The added ability to swivel the device into any orientation is appreciated. Rubber coated arms prevent marring of the tablet. 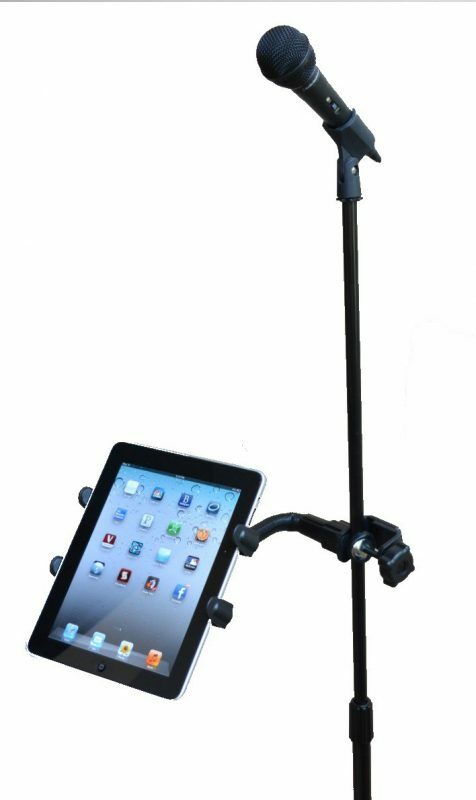 The The Joy Factory MagConnect Carbon Fiber Tripod and Microphone Stand Mount for iPad Air is a mount that includes a custom holder for the Apple iPad Air. The mount has the typical microphone stand screw pattern at the base. It’s made of metal and includes the well made Joy Factory MagConnect feature which allows quick attachment of the custom cradle to the mount. The mount pivots at the base and tip and is six inches long. The mount includes both the 1/4″ – 20 threaded or 5/8″- 27 threaded screw adapters. All three of these mounts work well on a microphone stand. Decide where you wish to place the Apple iPad, the width of the device and diameter of the microphone stand prior to selecting a mount. Using those specs, you should have an easier time in selecting the proper mount and prevent any return hassles.